The metallurgical industry can be broadly divided into metal production from feedstock consisting of primary and secondary sources. Primary production refers to the extraction of metal derived from ores and concentrates. Secondary production refers to the recovery of metal from materials such as alloys, electric arc furnace dust, ingots, and scrap. 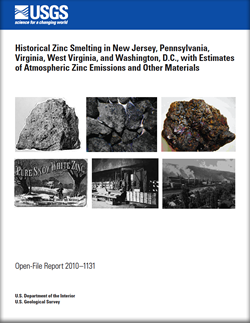 The foci of this study are the histories of selected pyrometallurgical plants that treated mostly primary zinc feedstock and the atmospheric emissions, primarily zinc, generated by those plants during the course of producing zinc and zinc oxide in New Jersey, Pennsylvania, Virginia, West Virginia, and Washington, D.C.
Bleiwas, D.I., DiFrancesco, C., 2010, Historical zinc smelting in New Jersey, Pennsylvania, Virginia, West Virginia, and Washington, D.C., with estimates of atmospheric zinc emissions and other materials: U.S. Geological Survey Open-File Report 2010–1131, 189 p.